OutsideView 8.1 has the ability to dynamically change toolbar labels to match the work you are doing. This means you no longer have to remember what the function keys do, in different contexts. If you are in Tedit, for instance, is it Shift+F3 or Shift+F4 that does a Move? In ViewSys, is the Cache Hit Rate under F7 or F8? With OutsideView’s Dynamic Toolbar labels, you no longer need to remember every Function key assignment in every context. Instead, the toolbar labels change as you do. 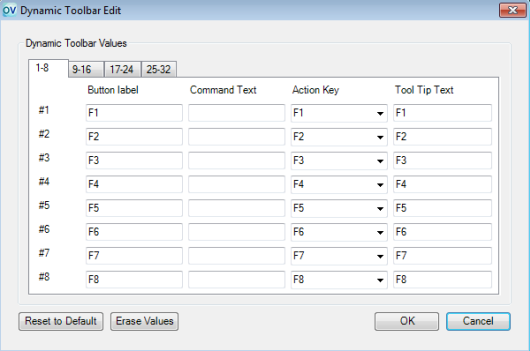 Would you like additional information about Dynamic Toolbars in OutsideView? The linked video covers how to use and how to configure it, to make function keys input easier, faster and more efficient than before. If you have any additional questions, please contact our Sales Engineer, Jim Hampton by email jimh@crystalpoint.com or phone 1-425-806-1141.